Have you ever wondered if your decisions could change the course of history? Questioned whether or not bad things happen for a reason? 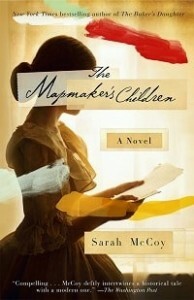 In Sarah McCoy's THE MAPMAKER'S CHILDREN: A Novel, two women's lives are inextricably linked as they struggle through personal conflicts and wade through mysterious secrets. As the chapters alternate between these two commanding female protagonists, the reader must redefine courage, family, and destiny alongside these two remarkable women. Sarah Brown, the fiercely independent daughter of abolitionist John Brown, is a talented artist in 1860s West Virginia. When Sarah discovers that she cannot bear children, she turns her skills toward helping others and becomes one of the foremost mapmakers for the Underground Railroad. Taking cues from Slave Quilt codes, she hides maps within her paintings as the United States moves toward a bloody civil war. Over one hundred and fifty years later, Eden Anderson, a modern-day woman struggling to conceive a child, moves into an old house in West Virginia as a last-ditch effort to save her marriage and start a family. When she stumbles across part of an old porcelain doll in the root cellar, Eden slowly uncovers a dramatic connection to the Underground Railroad. McCoy, whose novel The Baker's Daughter was a nominee for the 2012 Goodreads Choice Award for Best Historical Fiction, spent three years researching the Brown family history. This research became the basis for her inventive narrative, one in which McCoy honorably portrays the spirit of the real Sarah Brown and imagines her ties to the fictional Eden. Skillfully plotted and magnificently transporting, THE MAPMAKER'S CHILDREN highlights the power of community and legacy, illustrating the ways in which history and destiny are interconnected on one enormous, intricate map. The Mapmaker's Children is a story of secrets, loved denied, forgiveness, disappointments and finding healing in unexpected places. Dual time period books are a favorite of mine, especially when they revolve around real historical figures. It's 1859 and the events of Harper's Ferry are about to take place, leaving the Brown family in turmoil. Jump to 2014, Eden and Jack are struggling with life's disappointments, hoping their move to this old house will heal and give them the rest that they need. Usually when I read dual time periods it's the past story that I'm drawn to, but in this care it was the opposite. Eden has so much going on and it wasn't hard to feel for her. I loved the way her character evolved, watching the changes taking place was written in both a realistic and emotional manner. I could feel her disappointments and confusion during this time. Sarah Brown, daughter of John Brown seemed older than her years, though growing up during this time left little chance for children to be children and enjoy a carefree lifestyle. She was brave, creative and willing to take risks, especially where the Underground Railway was concerned. This is the first time reading anything by Sarah McCoy and I enjoyed it. She writes with feeling and clarity, I could visualize so much, from the old house, to the doll's head and the bookstore made me appreciate the research that went into The Mapmaker's Children. It might seem like a trivial thing to mention but one thing that usually stands out for me in books is dialogue, I think it's important to have the right balance, sometimes too much is just too much, not enough just lacks something, but this book had the perfect amount and she nailed the conversations just perfectly. I am a new fan. I loved the ended, everything was wrapped up nicely, a fitting conclusion to this story. Thank you to TLC Tours for allowing me to be part of this tour. SARAH McCOY is the New York Times, USA Today, and international bestselling author of the 2012 Goodreads Choice Award for Best Historical Fiction nominee The Baker's Daughter as well as The Time It Snowed in Puerto Rico and the novella "The Branch of Hazel" in Grand Central. She has taught English writing at Old Dominion University and at the University of Texas at El Paso. 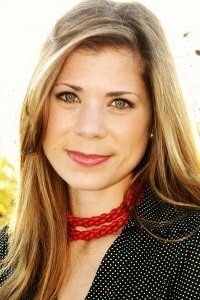 She calls Virginia home but presently lives with her husband and their dog, Gilly, in El Paso, Texas. Sarah enjoys connecting with her readers on Twitter at @SarahMMcCoy, on her Facebook Fan Page or via her website, www.sarahmccoy.com. I read this one about a year ago when I was lucky enough to win a copy. You should go back are read Sarah's earlier book, The Baker's Daughter. That one has really stuck with me. I've got a review on my blog. 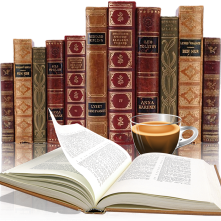 Dialogue is a big deal for me as well - it can make or break a book. I'm glad to see that it made this one!